Instant Pot Salmon with Rice Pilaf pairs lemon, butter, fish with a colorful garlic vegetable rice pilaf for a one pot meal. Instant Pot Salmon with Rice Pilaf is a nice meal for dinner parties. It is so quick and easy, you will have more time to spend with your guests. The lemon butter infused salmon takes this recipe over the top. Fresh garlic infused rice pilaf turns ordinary pilaf into an exciting eating adventure. 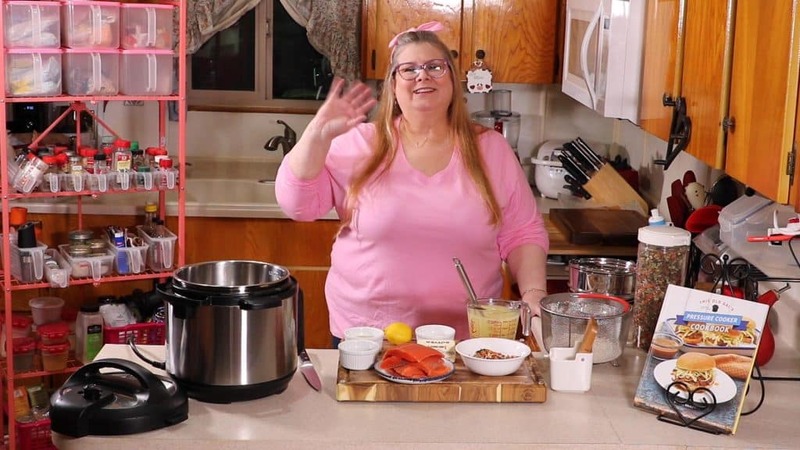 Fish can be very tricky when using an Instant Pot, Mealthy MultiPot or Pressure Cooker and cooking under pressure, but I have a trick for you! Actually, I have a couple of tricks up my sleeve! The salmon and the rice cook all in one Instant Pot, Mealthy MultiPot or Pressure Cooker, but the flavors of each will stay to themselves. This is especially good when there are people in the house who do not eat fish. They can still enjoy vegetable rice pilaf. 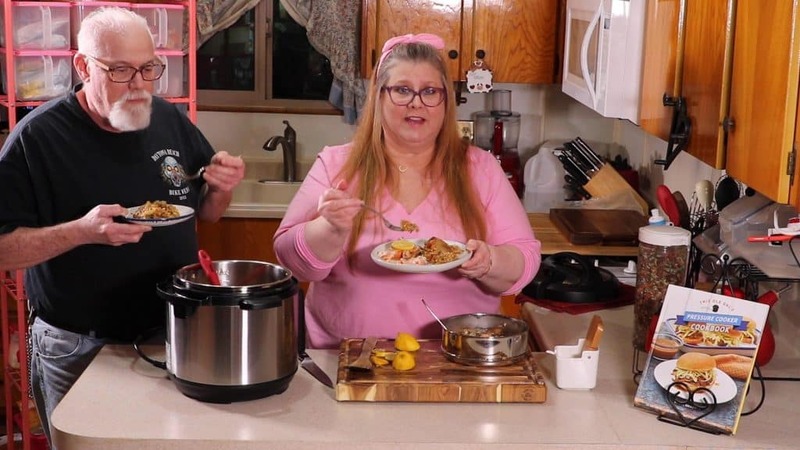 Those who follow a low carb or keto diet, will certainly enjoy my Instant Pot Lemon Butter Salmon! Better than Bouillon Chicken Base – no house should be without! Rice – for this recipe, I love that the rice does not clump and each piece is separate. Fresh Garlic – delicious Monviso Heirloom from California. Dehydrated Vegetables Soup Mix – get this!!!! Seriously, you won’t know how you lived without. 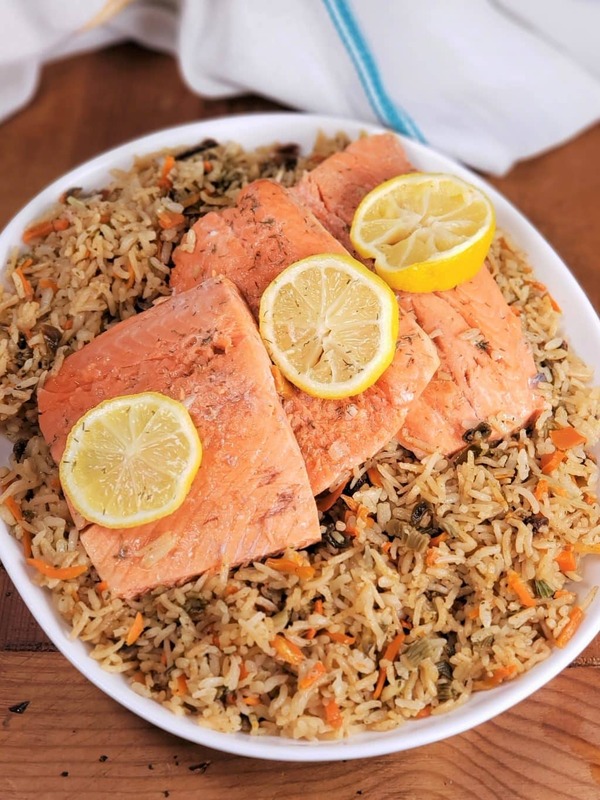 Just Take Me To the Best Salmon Rice Pilaf Recipe Ever! Rinsing the rice is always very important. 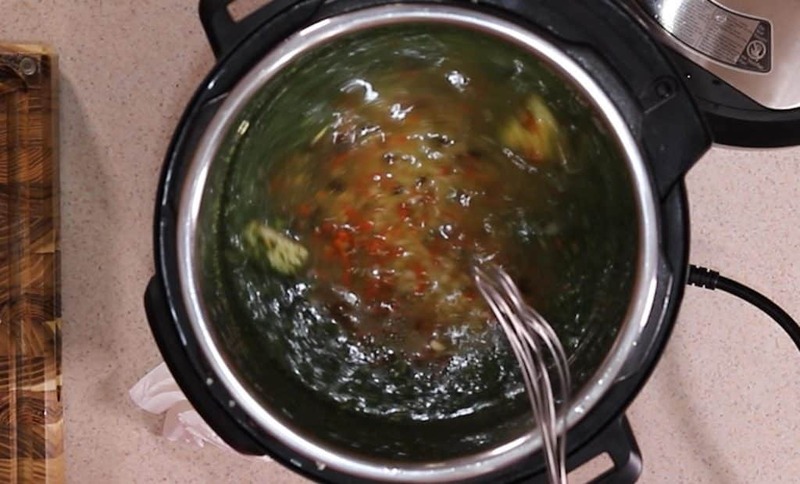 Not only will it help to remove some traces of arsenic, it will remove some of the starch and ensure the rice will cook more efficiently. 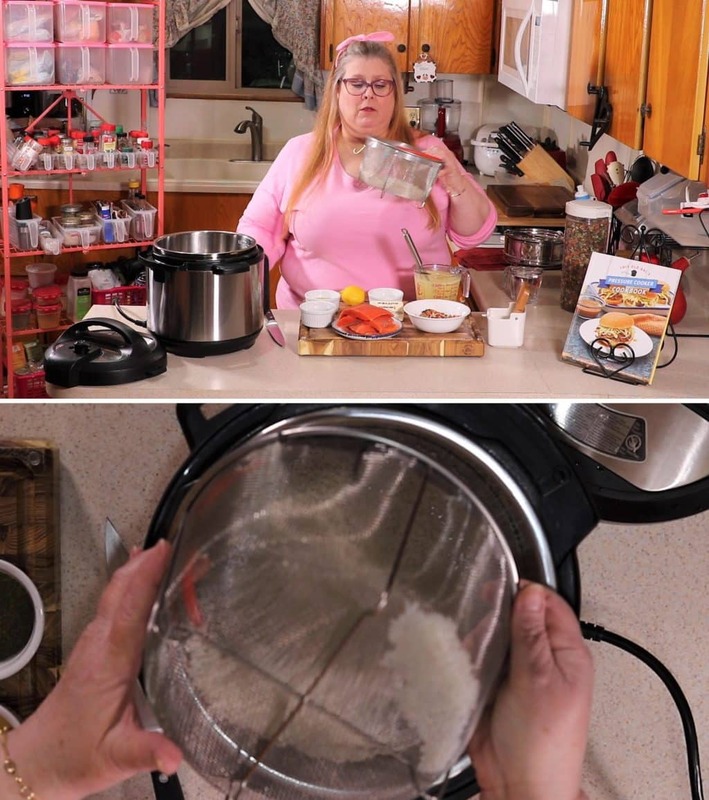 I’ve been using this steamer/strainer basket for rinsing rice, as well as for making Instant Pot Mashed Potatoes and Instant Pot Potato Salad. The most popular and best recipe for hard boiled eggs is my Instant Pot Hard Boiled Eggs recipe. The eggs just jump right out of their shells. don’t believe me? Make a batch with my method and then go and peel one. If you are not careful, your egg will go flying. 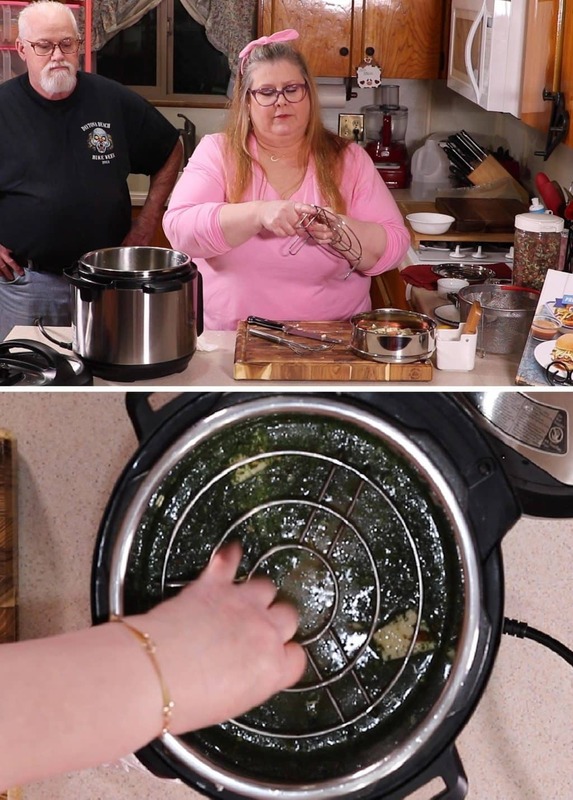 Grab a steamer/strainer basket if you don’t have one; you will be impressed. 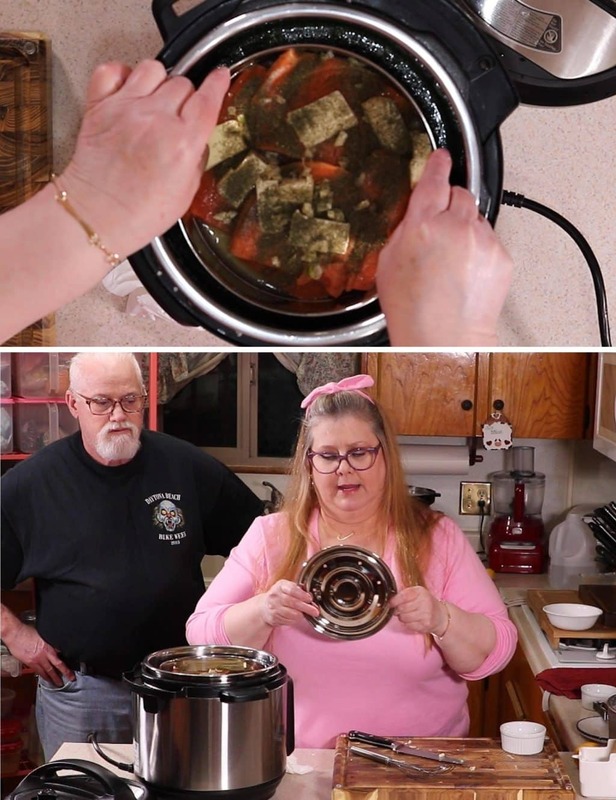 I’m always running out of my Instant Pot Bone Broth. We are never without a big jar of Better than Bouillon Chicken Base in our refrigerator. In fact, we use it probably more than my homemade chicken broth. IMO, all kitchens need Better than Bouillon Chicken Base in their refrigerator. 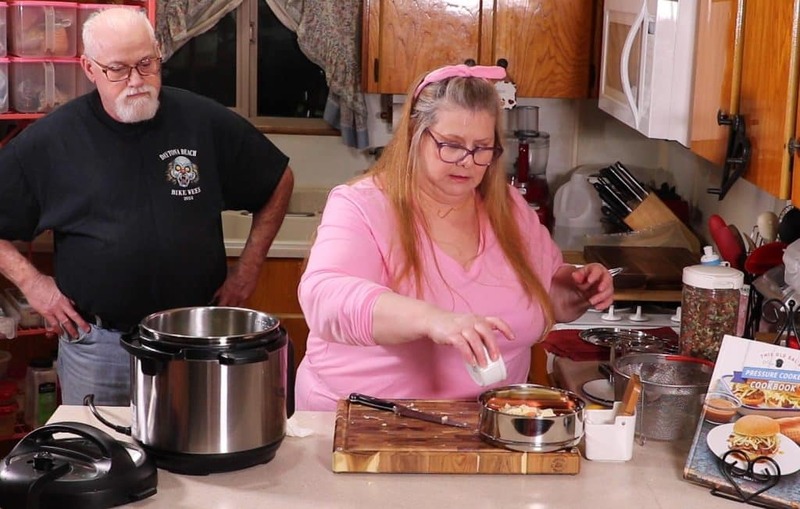 It’s easy to grab a measuring cup and whisk in a couple of teaspoons and of the chicken base and a little salt and make a very rich and delicious chicken broth. 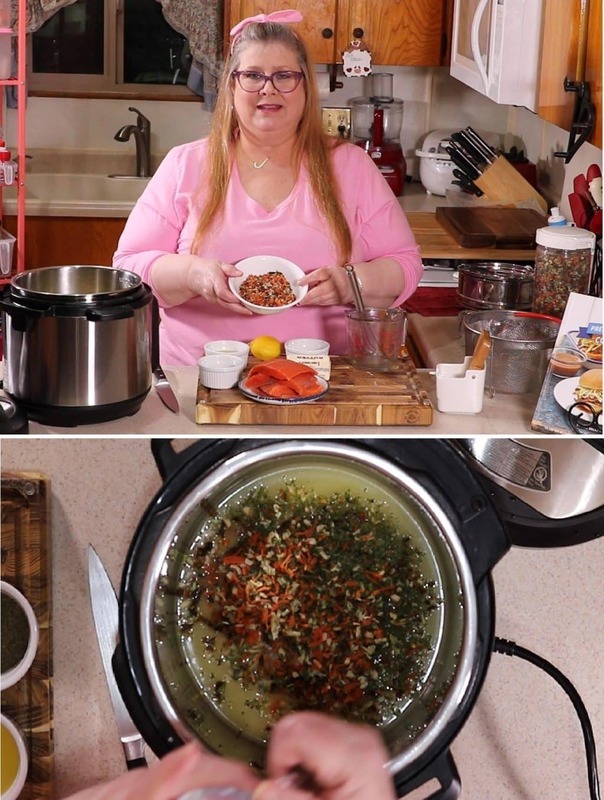 It all gets dumped into the Instant Pot, Mealthy MultiPot or Pressure Cooker, along with the rice. Now for my secret and trick. Do you worry you don’t get enough vegetable into your diet? 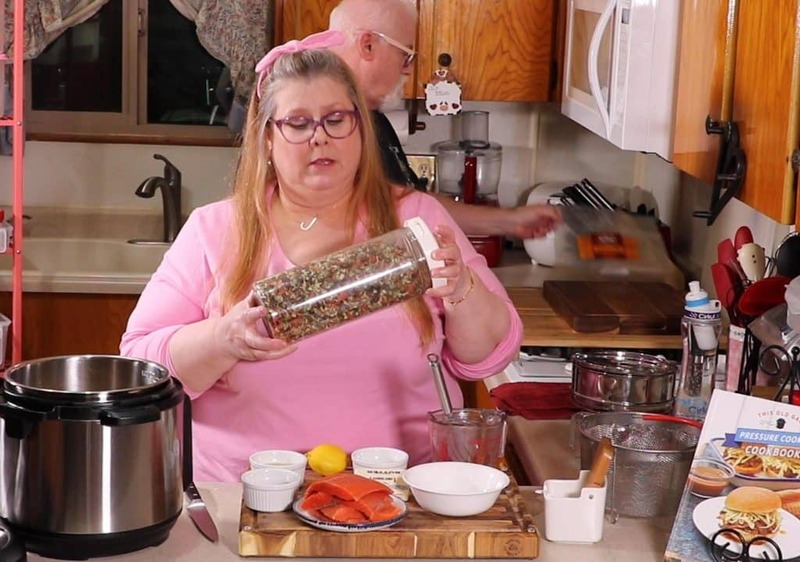 What if you could just grab a handful of dehydrated vegetables soup mix and toss then into soups, rice, stews, even a cup of chicken broth and whalaa, vegetables full of nutrients! The vegetables get thrown in right with the rice and broth and makes a simple, but delicious rice pilaf. Imagine having rice pilaf at any moment. With a quick cook time and the tools you need readily available, rice pilaf on your plate in under 20 minutes, start to finish. Dieting and want a quick snack? Heat up a cup of broth with the dehydrated veggies and you have a very filling snack. Follow my Instant Pot White Rice recipe and toss in half of cup of the dehydrated vegetables with half a cup of water and make rice pilaf anytime without any advance notice or having to shop for vegetables. Add them to my Instant Pot Chicken Fried Cauliflower Rice for a delicious and low carb meal. 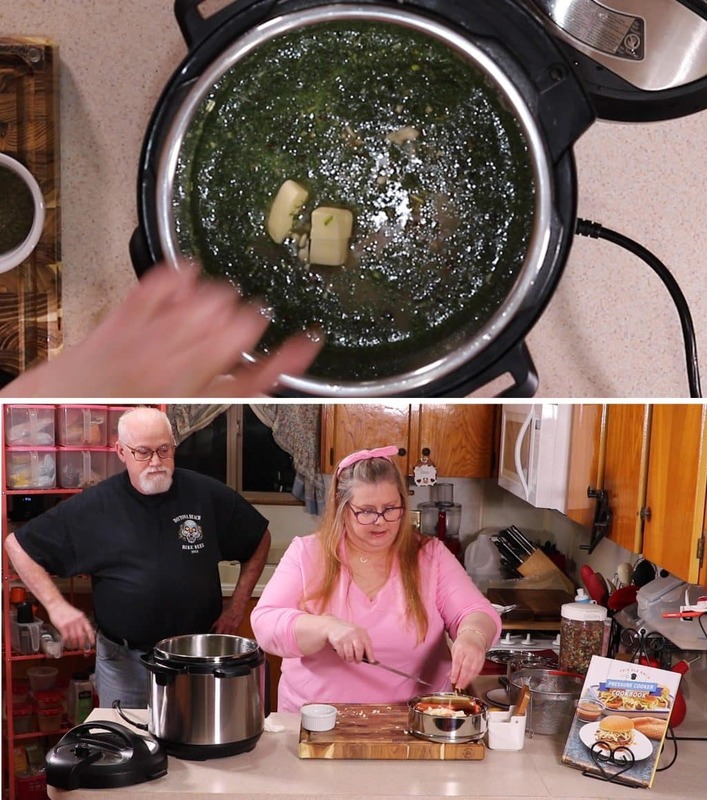 Toss a handful in my Pressure Cooker Americana Wedding Soup and enjoy a delicious bowl of soup. Hydrate a little veggies and add them to your tuna sandwich. Oh yes, it is good. Make sure to keep the dehydrated vegetables in an air tight container. You don’t want to chance any moisture or they will start to expand. Usually I use the pans in the reverse way, like you can see in my Pressure Cooker Perfectly Cooked Pot In Pot Rice recipe. If I can turn my main course into a pot in pot recipe and cook the rice, potatoes, cauliflower or veggies on top at the same time, I’m doing it. By cooking the fish on top of the rice pilaf inside of the closed cooking vessel, slows the cooking process of the fish, so that it won’t be over cooked. 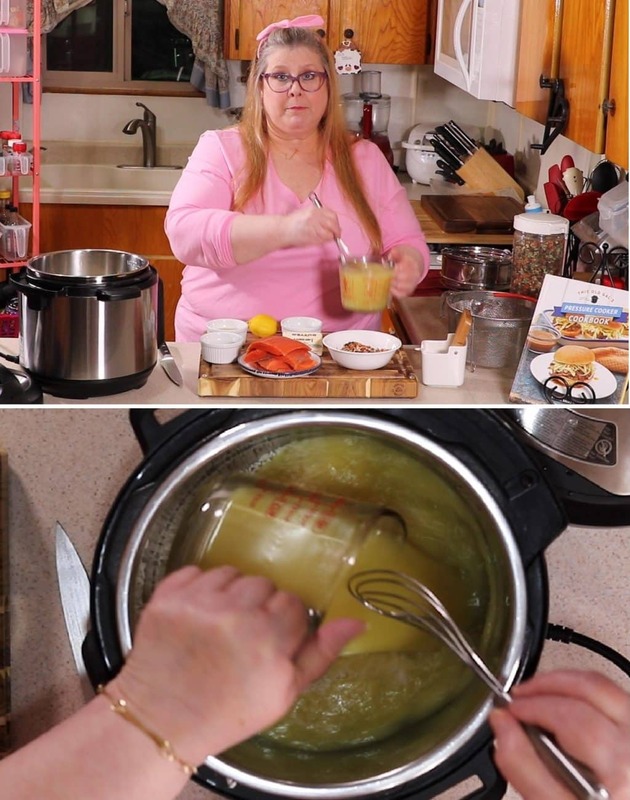 For a more intense flavor, try marinating the salmon in pickle juice! You could even pour in some dill pickle juice instead of using dill. Can Other Fish Be Used in Instant Pot Salmon with Rice Pilaf? Sure. Salmon is just a suggestion. Trout, Cod, Orange Roughy would be good here too. Make sure it is a fish, which you enjoy steamed. Definitely try Orange Roughy as it is a wonderful fish for this dish. Instant Pot Lemon Butter Salmon is so wonderful. You will find yourself using this same recipe for chicken too! Can Reduced Fat Butter Be Used? Of course. Any type of butter or butter type product can be used. Margarine, I Can’t Believe It’s Not Butter, etc. Whatever your family prefers is totally fine to use. Melted butter can be poured over the salmon too, if you prefer. Melt the butter and mix in the salt, dill and garlic and just pour it right over. The dill will be evenly disbursed. I don’t now many people who do not love garlic. OMG, the smell when it’s being sautéed in butter, oh so good. Peel off the tough skin of the garlic cloves. 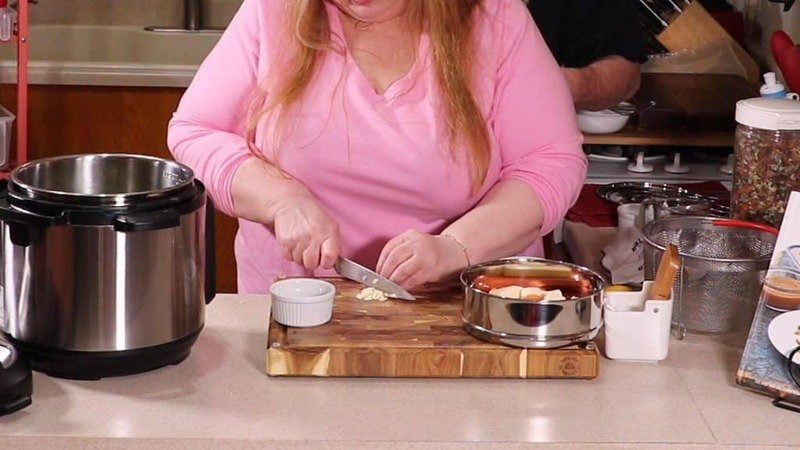 Use your knife and place it about an inch over the garlic with the blade facing right or left, so that the flat side of the knife is flush with the garlic clove. With the heel of your palm, quickly and sharply hit the knife/give it a whack over the cloves. This will smash the garlic. You always want to smash garlic prior to mincing. Then just use your very sharp knife and cut the garlic into tiny pieces, which is called minced garlic. Fresh garlic is always best to use, but if you don’t have fresh garlic in the house, you can buy jars of already minced garlic and store in the refrigerator. Truth be told, we keep a jar in the fridge for emergencies. You never know when a vampire might drop by. So, garlic rice. Have you ever had garlic rice? There is so much yum in garlic rice. Can Instant Pot Salmon with Rice Pilaf Be Frozen? If you have started with frozen salmon which was then defrosted, I don’t think it is a good idea to freeze the salmon. For fresh fish, I see no problem in freezing Instant Pot Salmon with Rice Pilaf into portions for later meals. Ed loves garlic in his rice and he is hoping I put garlic in this rice pilaf. So, I did. Use your fingers to sprinkle on the dill weed. Otherwise, you might pour in too much like I did. The rice pilaf is quite colorful. 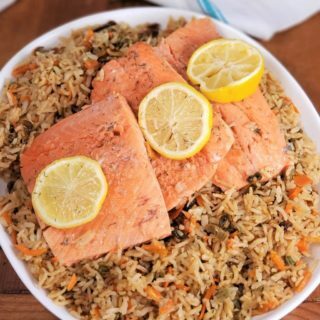 As the pan of salmon will sit on top of the rice, grab a tall legged trivet and put it right over the rice. Don’t use this much dill weed. My hand slipped and I poured in way too much! It easily scraped off and I was able to enjoy my dinner of Instant Pot Salmon with Rice Pilaf! Because I am using the lid with the holes, the fish will nicely steam. The pan with the salmon is really hot coming out, so be careful. 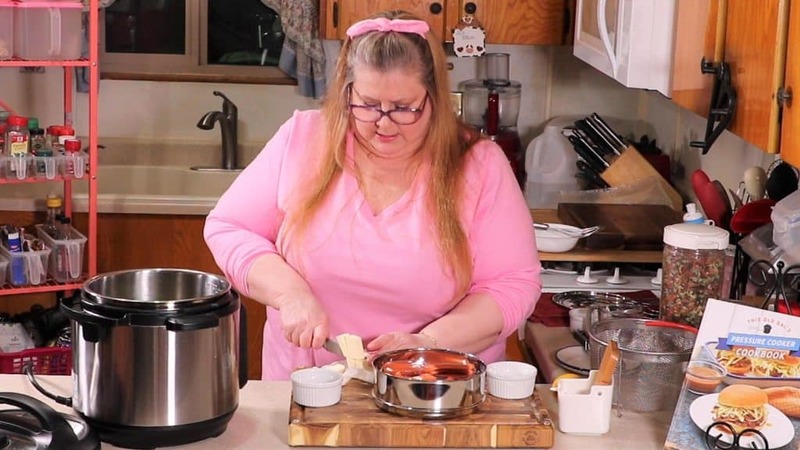 Watch the video and then scroll to the bottom for the printable recipe card. Rinse rice until it runs clear, so that it will not be sticky or clumpy. Dehydrated Vegetables Mix re-hydrate one to one, veggies to liquid. 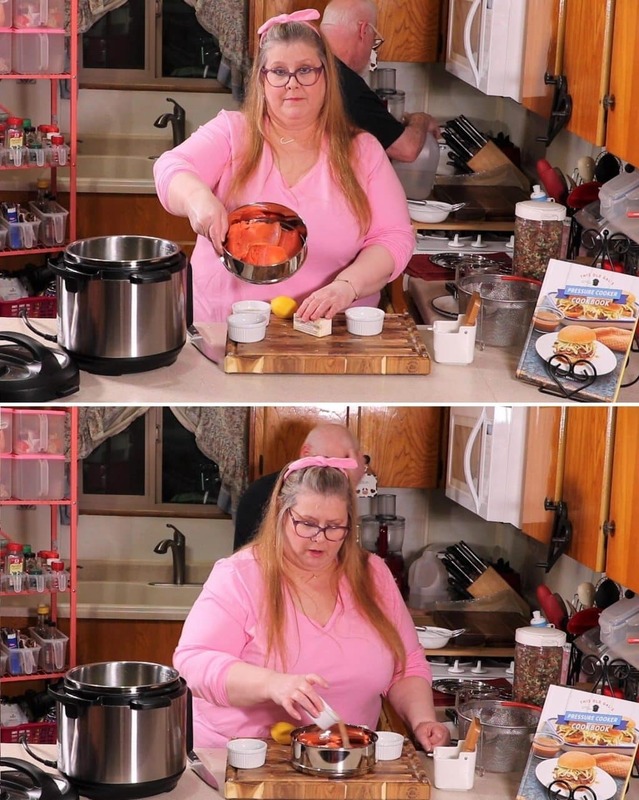 Remove any skin from salmon before cooking. Mince garlic really well as cook time is so short. Time to make a plate! So much delicious flavor. The salmon is nice and flaky. The rice pilaf is perfectly cooked and nice and fluffy and full of veggies and flavor. Instant Pot Salmon with Rice Pilaf makes a beautiful presentation. Do you want more fish and seafood recipes? Add rinsed rice, dehydrated veggies, 2 Tablespoons butter, 2 cloves minced garlic, 1 teaspoon salt and chicken broth to cooking pot. Melt butter and combine with lemon juice, 1 teaspoon salt, minced garlic and dill weed. Place salmon into pan and pour over lemon butter mixture. Cover with lid. Place trivet into pressure cooker and place insert pan on top of trivet. Remove pan of salmon and fluff rice. 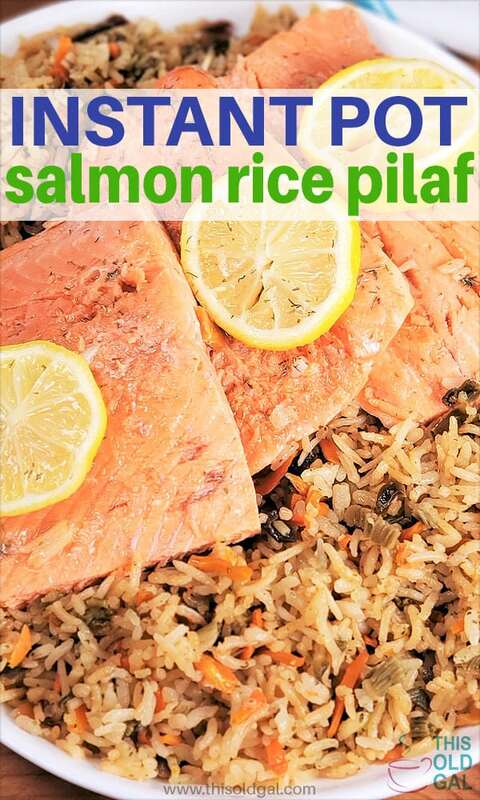 Place rice and serve salmon with slices of lemon wedges. 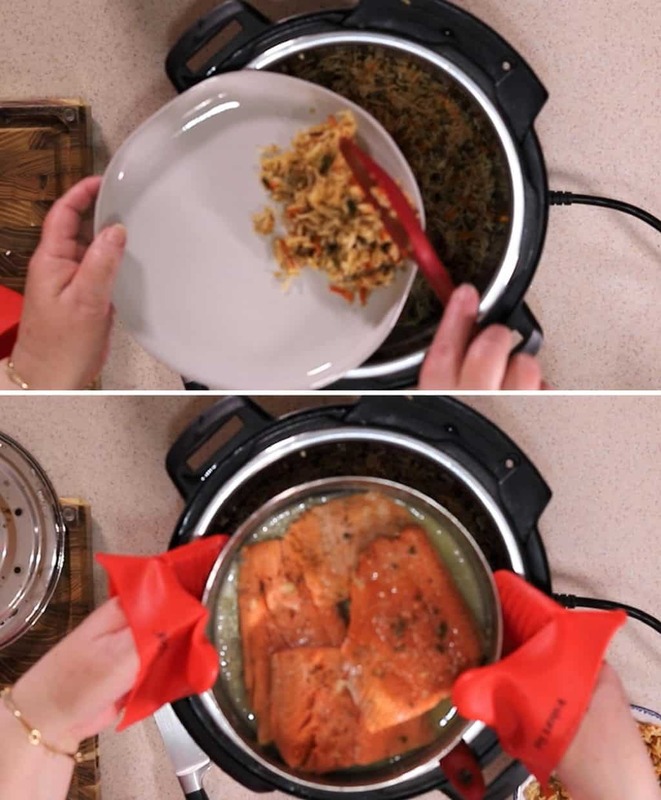 Pin this Instant Pot Salmon Rice Pilaf. I just loved the video tutorial! I’m a big salmon and rice fan, and an even bigger Instant Pot fan, so this was right up my alley. I have NOT cooked fish in the IP for fear of over-cooking it, but this makes me want to try it. Thank you for all your wonderful IP recipes! 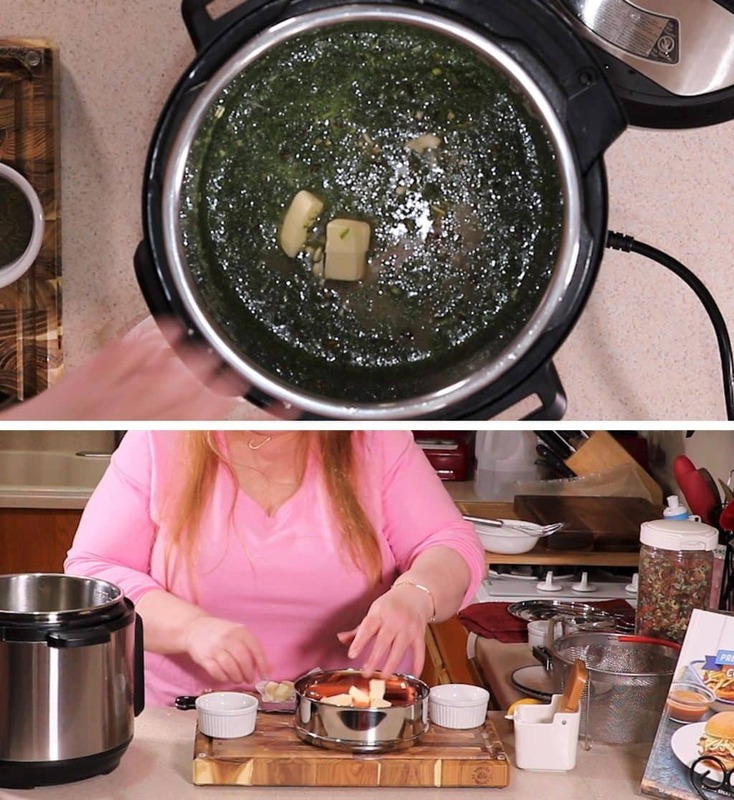 In the video, you added an additional 1&1/4 cups of water to the rice after adding the chicken broth. The printed recipe does not say to add any extra water. Which way is correct? Dont want the rice to be too dry or too wet.